Gemone Diamonds makes the finest quality of Multicolor faceted diamond beads. 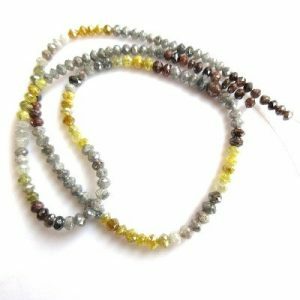 Multicolor diamond beads are mostly available as the strands in color mixed of white, gray, blue, black, gray and brown. multi-color faceted diamond beads is also called as the mixed color faceted diamond beads. the multicolor diamond faceted beads are from size 2 mm to 5 mm size mostly. and they can be customized as per the client’s requirements. The diamond beads are drilled using the laser for 0.18 mm to 0.30 mm size. the multi-color diamonds are perfect for making diamond beads strand, diamond beads chain, diamond beads bracelet and more finest quality of the fine jewelry. The multi-color diamond faceted beads are perfect for making the distinct kind of jewelry by jewelers, jewelry designers, and bespoke jewelry.